Introduced. Perennial. Propagates by seeds and by rootstocks. Time of bloom: June to August. Seed-time: July to September. Range: Newfoundland to the northwest provinces and British Columbia, southward to Virginia and Kansas. Habitat: Cultivated fields, meadows, pastures, roadsides, and waste places. The jointed, horizontal rootstocks are the most obnoxious part of the plant; round, slender, like tough, white whipcords, lying so deep in the ground as to be always sure of moisture, they creep in every direction for rods even (the writer helped to trace one over eighteen feet long), sending up new plants at short intervals; if broken and dragged about by farm implements, the pieces grow, so that ordinary cultivation but serves to spread the pest. Stem one to four feet tall, erect, slender, grooved, woody, nearly smooth. 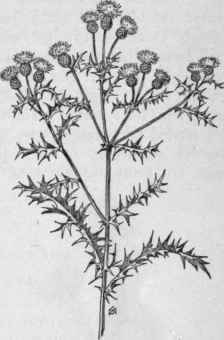 Leaves three to six inches long, sessile and slightly clasping, deeply and irregularly pinnatifid, the margins loosely crisped, toothed with hard, white, needle-like spines pointing in all directions. Heads in terminal and axillary clusters, the topmost ones opening first, the bloom proceeding in succession down the stalk. The heads are about a half-inch broad, imperfectly dioecious, the pedicels and bracts without spines, the florets rose-purple, fragrant. Achenes oblong, smooth, with fine, white pappus. Persistent starvation of the rootstocks by keeping them deprived of the food-assimilating green leaves; this means frequent cutting throughout the growing season for at least two years. In cultivated ground the required tillage keeps the weed in check. In grain fields a spray of Copper sulfate in a solution of fifteen pounds to a barrel of water (fifty-two gallons), applied before the grain begins to head and when the young thistles are not more than ten to fifteen inches tall, will so damage the succulent tops that the plants will not recover sufficiently to produce buds before they are again cut with the grain. After harvest new plants sent up by the rootstocks should be cut off with a broad-shared cultivator, the blades of which should be sharp and overlapping sufficiently to cut everything before them. Subsequent fall plowing will insure that the rootstocks get very little sustenance in that year. In the next season a well-tilled and profitable hoed crop should leave the ground clean of thistles and other weeds, and in good trim for a spring grain crop - barley or oats - which should be seeded with red clover. Waysides and waste places should receive attention; in these places the patches are best treated with hot brine, caustic soda, or kerosene, killing all other plant growth as well but ridding the ground at once of the prickly pests. Fig. 356. - Creeping or Canada Thistle (Circium arvense). X 1/4.